OMAHA (CNNMoney) -- Warren Buffett addressed his prostate cancer diagnosis head on Saturday, dismissing it as a "non-event." "I feel terrific," Buffett said in response to a question at the Berkshire Hathaway annual meeting. 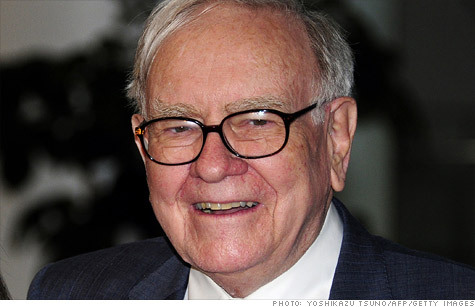 "I have four doctors, at least a few own Berkshire Hathaway (stock). They described various alternatives and the ones they recommended do not involve a day of hospitalization, they don't require me to take a day off work, the survival numbers are way up. So...maybe I'll get shot by a jealous husband but this is a really minor thing." In a letter to shareholders last month, Buffett, 81, disclosed that he had been diagnosed with prostate cancer. The announcement sparked discussion about who'll take over from Buffett one day. Buffett has yet to publicly reveal the succession plan, though he says he has already informed Berkshire's board about his preferred candidates. Upon his departure, Buffett's job will be divided between a CEO in charge of operations and one or more executives in charge of investments. Berkshire (BRKA, Fortune 500) owns more than 80 companies, including insurer Geico, chemical company Lubrizol, railroad company Burlington Northern Santa Fe and MidAmerican Energy. On Saturday, Buffett once again spoke favorably of Ajit Jain, who heads the firm's reinsurance business, and has been regularly mentioned by Berkshire-watchers as a possible successor on the operations side. "Ajit has created something out of nothing," said Buffett. "He just brought brains and character to something and he's created a business like nothing I've ever seen." Buffett's No. 2, Charlie Munger, was also quick to make light of the issue: "I resent all this attention Warren is getting. I probably have more prostate cancer than he does. But I don't know because I don't let them test for it," he said.